"Kung Pow" redirects here. For the foodstuff, see Kung Pao chicken. Confused, The Chosen One journeys out to a field and consults the heavens for confidence. Suddenly Mu-Shu Fasa, a large sentient lion, appears in the sky and dispenses advice in a scene parodying a portion of The Lion King. He returns to town and finds that Betty's hostility has expanded to the entire town, and they are killing anyone who may be his allies. He finds Wimp Lo, Ling, Master Tang and even his dog heavily maimed. However, except for Lo, they all survive. After taking Ling and his dog to safety, The Chosen One begins training himself. Believing Betty's weak points are the pyramid spikes embedded in his chest, The Chosen One makes wooden dummies, embeds similar spikes onto their chests and attempts to pluck them out with his bare hands. His hands are battered and he is exhausted, but after Ling treats his wounds and gives an inspiring speech, he finds himself rejuvenated and successfully pulls off the attack. Meanwhile, Betty is called by the mysterious Evil Council and learns that The Chosen One is alive. The Chosen One confronts Betty at the temple. They fight evenly, until the Evil Council shows up revealing themselves to be French aliens, and gives Betty supernatural powers. Betty viciously beats up The Chosen One, who, in a semi-unconscious state, sees visions of Whoa and Mu-Shu Fasa giving him advice. Mu-Shu instructs him to open his mouth. As soon as he does, Tonguey flies out and attacks and destroys the mother ship, causing the entire Evil Council armada to panic and retreat, leaving Betty vulnerable. The Chosen One eventually rips the pyramid spikes out of Betty's chest, killing him. As The Chosen One returns home with Ling, his tribulations are far from over, as presented in a trailer for a sequel, Kung Pow 2: Tongue of Fury, that immediately follows the final scene. In a post-credits scene, Master Tang, who has been left behind, asks someone to help him from a hungry golden eagle eating his leg. Fei Lung – Master Pain a.k.a. "Betty"
In many scenes, Jimmy Wang Yu, the lead actor in Tiger & Crane Fists, was replaced by Oedekerk via post-production chroma key and digital compositing techniques such as head replacement. Oedekerk also re-dubbed all of the original cast's voices himself, inventing a different voice for every character. The only exception is the character of "Whoa", who was voiced by her actress, Jennifer Tung. During filming of their scenes, Oedekerk and Tung spoke nonsensical lines, which were later re-dubbed with the correct lines from the script, in order to maintain the appearance of poorly-dubbed foreign language consistent with the rest of the film. Alternate audio tracks, including the "What They Are Really Saying" track, which includes the original Chinese and the speech Oedekerk uses to parody the bad dubbing in old kung fu movies. Another notable audio choice is 'Book on Tape', where all the lines are read by a calm British narrator. Alternate ending featuring Betty in a speedo singing the Kung Pow! theme song. Kung Pow! Enter the Fist received an 11% rotten rating on Rotten Tomatoes, as well as an average score 14 out of 100 on Metacritic. Kung Pow! Enter the Fist grossed a total of $17 million worldwide on a budget of $10 million. During an interview in 2012, Oedekerk said if he were to make a sequel to Kung Pow! that, instead of making a direct sequel alike to the first, he would instead like to have it use footage from a spaghetti western from Italy or Mexico, rather than a martial arts film. On July 23, 2015, it was announced that a sequel is currently in the works, with Oedekerk returning to write and direct. 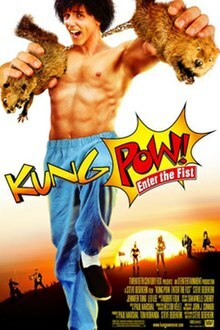 ^ "Kung Pow - Enter the Fist". British Board of Film Classification. Retrieved May 27, 2017. ^ "Kung Pow: Enter the Fist (2002)". The Numbers. Retrieved January 1, 2016. ^ "Kung Pow! Movie Reviews". RottenTomatoes.com. Retrieved September 16, 2009. ^ "Critic Reviews for Kung Pow: Enter the Fist". Metacritic. Retrieved January 14, 2014. ^ Wilson, Tom. "Big Pop Fun #9: Steve Oedekerk (3)". Nerdist. Retrieved September 4, 2018. ^ "Steve Oedekerk is working on a Kung Pow: Enter the Fist sequel". Retrieved December 21, 2016.